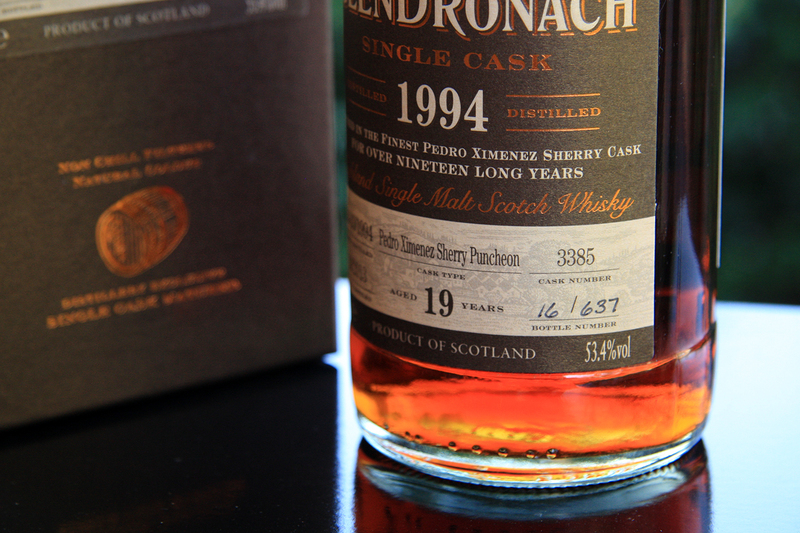 If you’re into heavily sherried whiskies, there’s a good chance you’ve heard of Glendronach. Their regular core range is pretty top-notch, consisting of four different offerings ranging in age from 12 through to 21 years. The bottle being tasted isn’t actually part of their core range though. 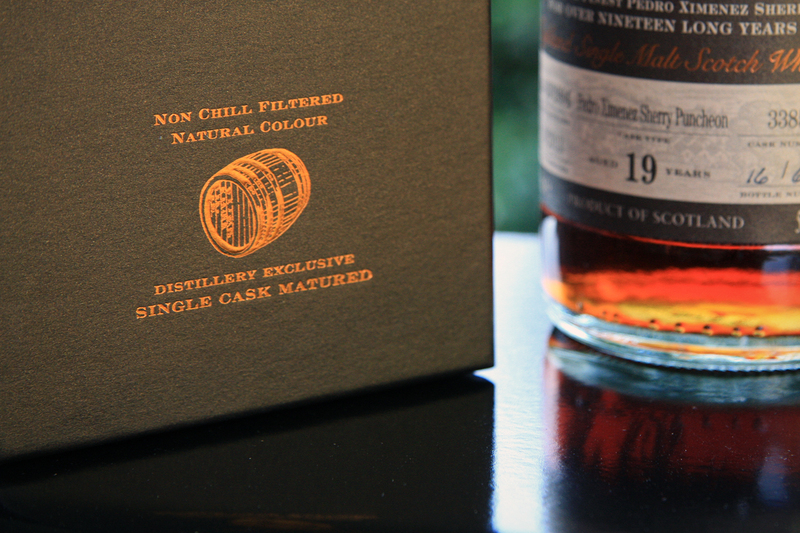 It’s part of their semi-annual limited release of ‘single cask’ expressions, which are bottled at natural cask strength. You don’t see these too often in Australia, so when a friend suggested I review his bottle, I wasn’t exactly going to say no! Look at that colour! It’s like treacle or golden syrup! I don’t know about you, but when I see a whisky that colour – and when I know that it’s natural colour – I get pretty damn excited. The presentation of these bottles is pretty special – rich metallic brown packaging scribed in copper coloured lettering. The box is also lined in a sand colour suede-like material. You feel a real sense of occasion when you pick up and open the box on one of these. 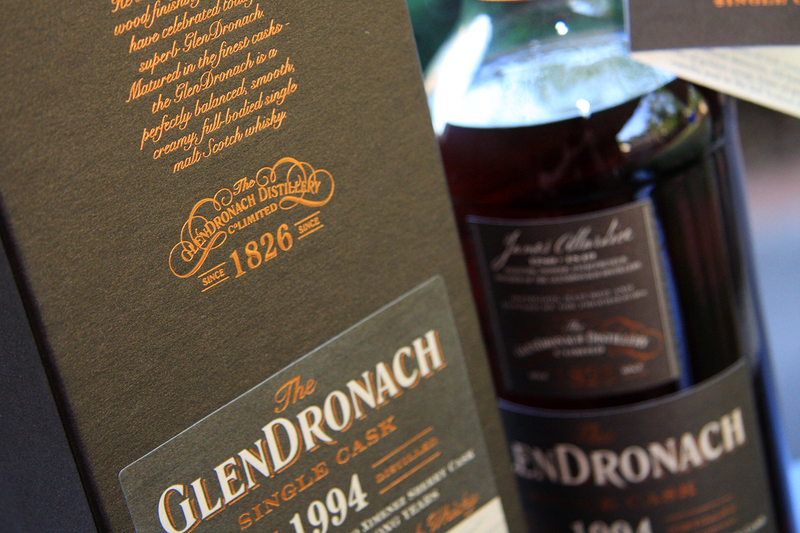 Apart from being bottled at cask strength, all of Glendronach’s single cask releases are non-chill filtered (NCF) and bottled at their natural colour – something they’re quite proud of. This is as close as many of us will come to drinking straight out of a cask! This particular bottle is from batch 9 of their single cask releases. Distilled in 1994 and matured in a Pedro Ximenez Sherry Puncheon – one of the larger casks used in the whisky industry at around 500 litres in size. 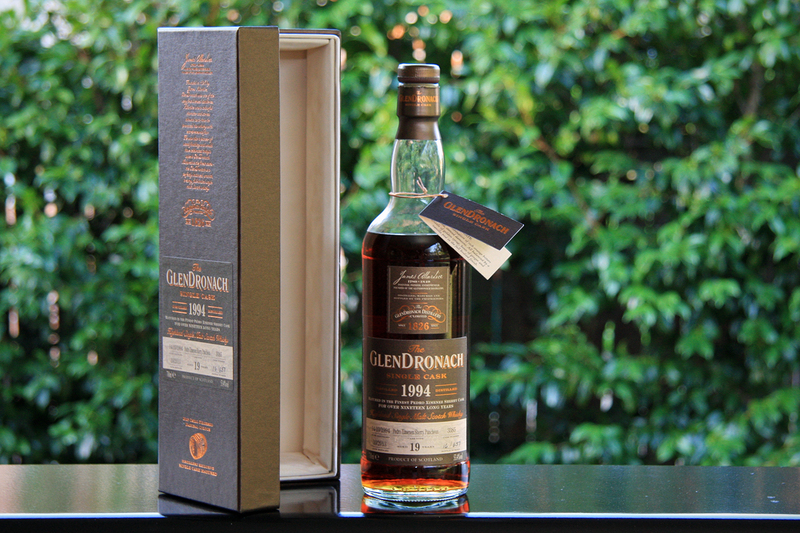 When this particular batch of whisky was distilled in 1994, Glendronach still floor malted their own barley (instead of buying malted barley in from somewhere else). As part of the malting process, they dried their barley over a coal and peat fuelled fire, resulting in a spirit that was peated to around 14 parts per million (PPM). This is nowhere near the ~55-60 PPM of something like an Ardbeg 10 year old, but it’s still pretty peaty for a Speyside whisky! Immediately I got classic sweet PX sherry with some tarty notes in there – almost like tarty raisins or apricots. Sniffing it again (and this might sound a bit crazy), I was reminded of caramelized peaches – you know, when you cut one in half, sprinkle brown sugar on it, add a knob of butter then put it under the grill in your oven. Lovely rich caramelized sugar and fruit notes, with a hint of burnt spice. A really deep nose that you can sniff and sniff and sniff. If you leave this to sit for a good while in the glass it really opens up and the brown sugar raisin notes really come to the front quite nicely. The first thing you notice is how thick, syrupy and tongue coating it is. Just brilliant. Sweet dried raisins, hint of spice, slight oakiness and a really faint sour fruit note – maybe orange marmalade? All of the flavours are really complimentary – no single one jumps out sharply at you. The finish is long and warming, not fierce at all, a real winter chest warmer – which is kind of ironic considering I tried it on a 40 degree (104F) summer day in Sydney! Fruity sweetness eventually fades and some of the tannic oak starts to show through after a good few minutes. Even though this is bottled at 53.4%, it’s incredibly drinkable and that extra few percent – combined with the non-chill filtering – really locks in a huge amount of flavour. When I see that kind of ABV, I often consider adding a few drops of water, but I don’t think this needed any all. I did test it out, but I personally think it lost some of its magic. A bit of patience and some glass time is all this one needed to really shine. Seeing as though The Whisky Ledger is based in Australia, I thought it would be fitting to make one of the first entries a local whisky. 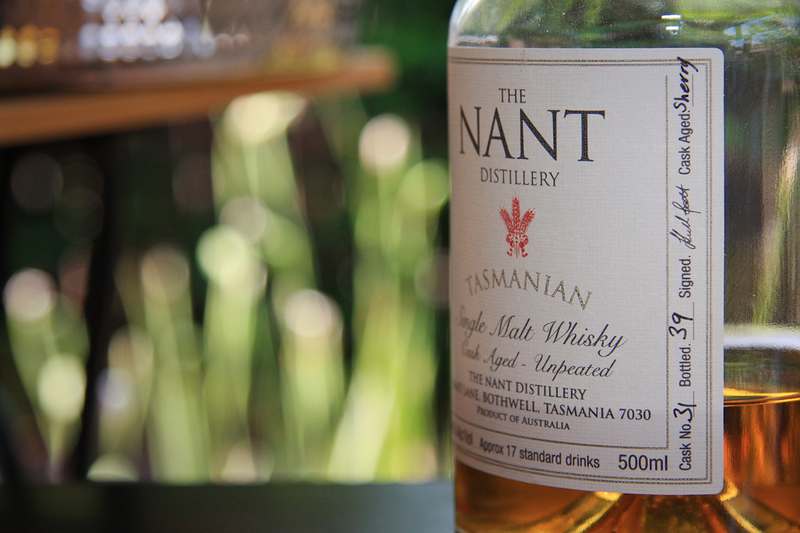 This little gem hails from Australia’s only ‘highland’ distillery, Nant, which can be found in a quaint little Tasmanian town called Bothwell. After heading an hour north of Hobart, you put your faith in your GPS and turn off a sealed road onto a slightly dodgy-looking dirt and gravel track. After a bit, your GPS starts blinking and telling you that you’re no longer driving on a road of any description. Stones start to flick up and clank against the side of your car and you start thinking about that little clause in your hire-car contract about avoiding roads like this… then before you know it, you’re greeted by this. 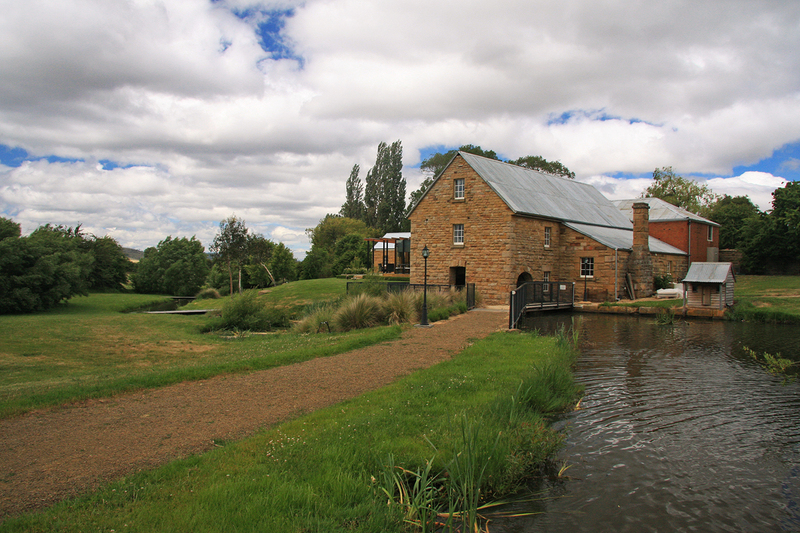 I could go on for pages about the distillery itself, it’s just spectacular and has some great history behind it. I’ll save that for another time though, as this post is all about the liquid. 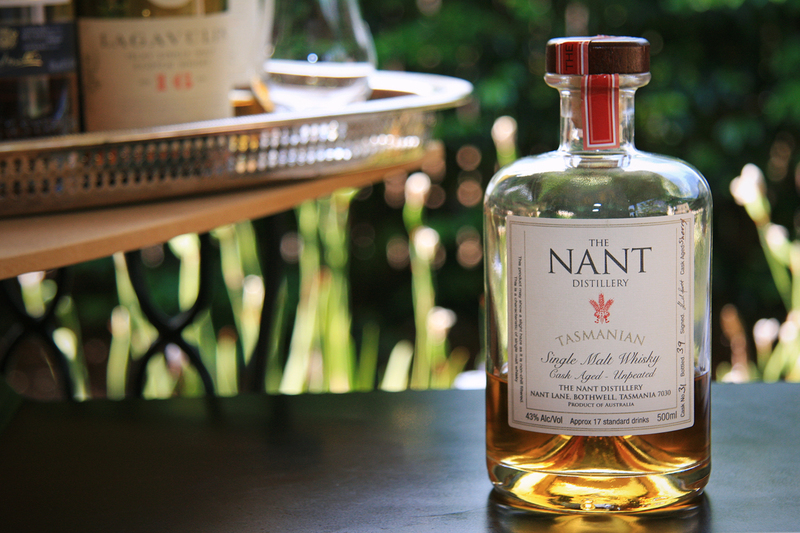 The Nant single malts have an almost apothecary styled presentation, not all that dissimilar to the Elements of Islay bottling. I like the fact they’ve gone down this path with a squat, broad bottle – something a bit different to your classic taller single malt bottles. This particular bottle was from an American oak sherry cask, which was cut down and re-coopered in Australia to a size of 100 litres. The labels are hand numbered with batch and bottle numbers, so you really know that you’re about to sample some small-batch, craft distilling. Easy to tell it’s a sherry cask, but quite different from the sherried nose you get on a Scottish single malt – it’s sweeter, lighter and slightly creamy – not that all out rich red-fruit kind of nose. You could almost say it’s got sherried-bourbon characteristics, which could have something to do with the fact it’s matured in an American Oak cask (albeit, an ex-sherried one). Really easy to nose this one for a while. The nose carries through to the palate pretty well – nice medium mouth feel to it with some oils, initial sweetness, followed by spice and light alcohol burn. This release was pretty young (around three to four years), but it certainly doesn’t lack character. The palate fades reasonably quickly to a long and slowly warming finish – you get this great, tingle at the front of your tongue, accompanied by a slightly creamy sherry coating at the back that just lasts and lasts. This bottle has been open for around a year and has really evolved. At first it was a bit on the thin side and the younger spirit shone through, but with some air it’s really opened up and matured. It’s got some nice body to it now and those creamy sherry notes have become more pronounced. I recently had the pleasure of re-trying their bourbon barrel cask-strength (which rates in the mid-90s by Jim Murray) and a port-cask version, bottled at 48% which had a pretty amazing palate to it. There’s some really good stuff coming out of them there hills – one to keep an eye on for sure.